Discovered and claimed by Portugal in the late 15th century, the islands' sugar-based economy gave way to coffee and cocoa in the 19th century - all grown with African plantation slave labor, a form of which lingered into the 20th century. While independence was achieved in 1975, democratic reforms were not instituted until the late 1980s. The country held its first free elections in 1991, but frequent internal wrangling between the various political parties precipitated repeated changes in leadership and two failed coup attempts in 1995 and 2003. In 2012, three opposition parties combined in a no confidence vote to bring down the majority government of former Prime Minister Patrice TROVOADA. The new government of Prime Minister Gabriel Arcanjo Ferreira DA COSTA is entirely composed of opposition party members with limited experience in governance. New oil discoveries in the Gulf of Guinea may attract increased attention to the small island nation. This small, poor island economy has become increasingly dependent on cocoa since independence in 1975. Cocoa production has substantially declined in recent years because of drought and mismanagement. 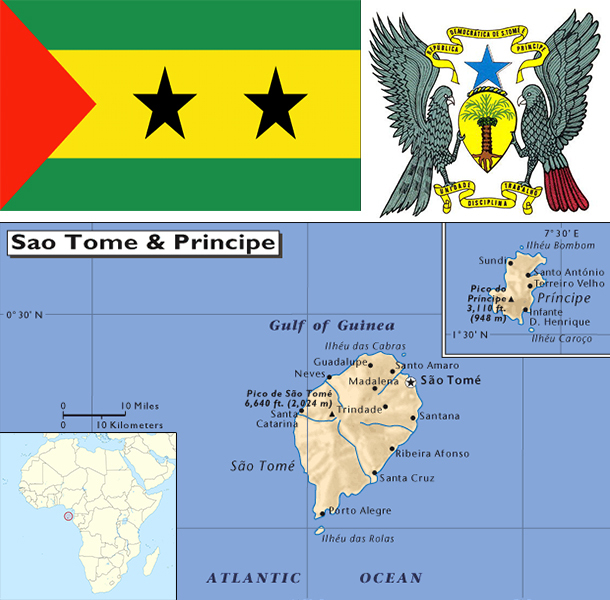 Sao Tome and Principe has to import fuels, most manufactured goods, consumer goods, and a substantial amount of food, making it vulnerable to fluctuations in global commodity prices. Over the years, it has had difficulty servicing its external debt and has relied heavily on concessional aid and debt rescheduling. Sao Tome and Principe benefited from $200 million in debt relief in December 2000 under the Highly Indebted Poor Countries program, which helped bring down the country's $300 million debt burden. In August 2005, the government signed on to a new 3-year IMF Poverty Reduction and Growth Facility program worth $4.3 million. In April 2011 the country completed a Threshold Country Program with The Millennium Challenge Corporation to help increase tax revenues, reform customs, and improve the business environment. Considerable potential exists for development of a tourist industry, and the government has taken steps to expand facilities in recent years. The government also has attempted to reduce price controls and subsidies. Potential exists for the development of petroleum resources in Sao Tome and Principe's territorial waters in the oil-rich Gulf of Guinea, which are being jointly developed in a 60-40 split with Nigeria, but any actual production is at least several years off. The first production licenses were sold in 2004, though a dispute over licensing with Nigeria delayed the country's receipt of more than $20 million in signing bonuses for almost a year. Maintaining control of inflation, fiscal discipline, and increasing flows of foreign direct investment into the oil sector are the major economic problems facing the country.